There are at least two sides to every story, and writer/director Drew Goddard uses that conceit to craft a meticulously told tale of crime and punishment in Bad Times at the El Royale. This twisty, turny tale of mischievous double identities is a compelling, entertaining story that very nearly justifies its two hour and twenty minute run time. The El Royale Hotel is a bi-state establishment in the hills near Reno, Nevada that straddles the border between the peaceful state of California and the last great Wild West outpost of Nevada. One by one, a group of travelers roll up to the establishment seeking lodging and a good night's rest, or so they say. These travelers, priest Father Flynn (Jeff Bridges), would-be soul singer Darlene Sweet (Cynthia Eviro), and traveling salesman Laramie Sullivan (Jon Hamm), all seem to be hiding something, and little by little a crazy set of intersecting stories unfolds in the El Royale and no one will leave the same way they came in. My experience of Drew Goddard stems from his meta-horror extravaganza The Cabin in the Woods, a film that was infamously shelved for years after completion and dumped unceremoniously into theaters in 2012 to relatively positive critical response. That film showed Goddard and his co-writer Joss Whedon to be astute students of not only horror film tropes, but also obsessively aware of structure and the way it can successfully manipulate an audience. 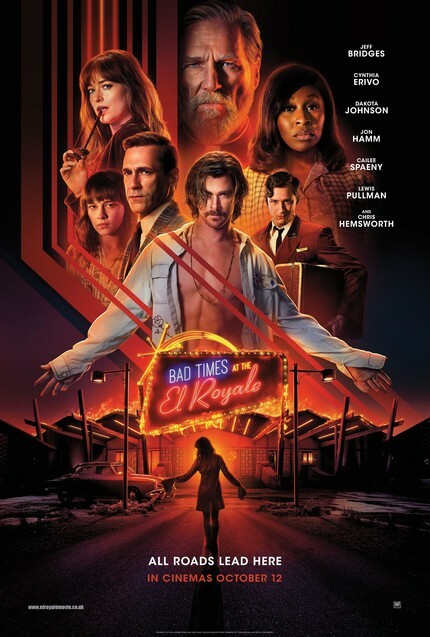 With Bad Times at the El Royale, Goddard goes back to those lessons to create an intricately structured puzzle that plays with timelines, expectations, and even visual and aural symmetry to lead the audience into a corral where he can slaughter them with third act revelations that will blow their minds. It's a fascinating and intriguing watch, and an incrementally growing supporting cast help to stretch out the mystery and provide numerous red herrings that feel manipulative, but in the way that will elicit more smiles than groans from most audiences. The appearance of a Manson-esque cult leader (Chris Hemsworth) and a pair of his acolytes (Cailee Spaeny and Dakota Johnson) throw what could be an eye-rolling spanner into an already complex works, but Goddard and his capable cast of leads - already dwindling by the time these characters arrive - handles the mess with clever grace. The film focuses on the duality within all of us, mirrored by not only the physically split layout of the El Royale, but also rows of literal mirrors in some of the film's more visually and aurally entrancing sequences. The film is edited like a symphony, utilizing each of the elements - dialogue, sound effects, visual cues, and camera angles - to present the viewer with a full-bodied experience that feels like, dare I say it, art, if pulp art. As the characters’' true motivations become more apparent, so does the style of the film grow more complex and flamboyant, with ever increasing thrills and surprises that beckon the viewer to lean into the experience. All of this artifice is amply supported by the lead performances of Bridges, who is amazing as usual, and Eviro, who was a new face to me, but one I'll definitely be keeping track of from here on out. Without giving too much away, both are characters who feel a loss of something they've worked hard to achieve who are reaching for a new start by earning their way back to success. Thus, even though they are on opposite ends of the moral spectrum for much of the film, they grow to admire, respect, and even love one another by the time the story ends. It reminds me of one of the most common translations of the Hindi greeting, "Namaste", "the divine in my recognizes the divine in you", these two characters may not share a common moral compass, but they recognize what they have in common and bond deeply over it. I would be remiss if I failed to mention the balls out excitement, action, and violence of Bad Times, but for all that flash, it is the characters that matter most. Goddard is no stranger to buckets of blood, as Cabin would prove, and in Bad Times, he adds cauldrons of hellfire and a hail of bullets to the mix, making this a boisterous experience even for those who don't care much about the careful characterizations. Bad Times at the El Royale is a fascinating film that appeals to the best in us, while still managing to sate the worst in us and out thirst for blood and violence, and for that I salute it.